While our family primarily had a positive experience with homeschooling, it was not without its bumps. But hey, that’s life, huh? Over the course of some 19-20 years worth of educating my kids at home, some things – both good and bad – stand out more than others. For instance, travel. Travel was good. Teaching my 3rd to read? Not so good. We discovered she was dyslexic, but after 2 successful attempts teaching the boys to read to the point where they went everywhere with reading material in hand, having to continually work through her difficulties and dislike of reading almost made me give up. Also bad? My oldest challenging my every decision every minute. Of every day. That was probably the worst thing about homeschooling: being both mom and teacher. In one way, it was also the best, but it was easier for me to separate those roles than it was for my kids, especially my oldest. Sometimes, he’d be upset with what I told him as a mom – “clean your room,” “brush your teeth,” “don’t stay up so late reading,” etc… – that it affected how he did his school. Likewise, when he had assignments to complete or didn’t do well on a test, he’d carry his poor attitude with him to the dinner table. While I’m sure that many moms whose kids are in “real” schools are affected by what kind of day their children had at school, or perhaps teachers have to put up with kids who’ve had issues at home, it’s kind of, no, it IS exhausting when it happens all day every day. 24.7. With homeschooling, there is no going home or to work to get away! This probably only pertains to certain kids. But of course, every family has one who pushes more than the others, right? My younger two challenged me above & beyond on occasion, but my oldest was a colicky baby and had us over-thinking everything from birth. In retrospect, it wasn’t just us that he questioned, it was everyone and and most everything as well. Another difficulty of homeschooling? Wondering if we were enough, or we were doing enough to provide a good education. This is probably the most common thing I’ve heard from the homeschooling families I know: Are you educating them well? Are you making a difference? Will they grow up to be functional, responsible, kind human beings? Are they getting not just a good enough education, but a good education? I know home educators who have a PhD, and they still wonder if they’re getting it right! Whether it’s private, parochial or homeschool, mainstream education has, if we recognize it or not, spilled over into the homeschool arena. I think it might be part of the culture of “stuff” but it’s not enough any more just to get into college. Even in the homeschool community, many families take on copious extracurriculars so that their children have the right résumé to get into a “good” school. I know. I was one of those families for a time. Which brings me to another thing about homeschooling that was difficult: knowing when to say when. Especially when you’re new to homeschooling, or as high school approaches, you tend to feel like you have to compensate for all you’re NOT doing. In most public and private schools still, class periods are set aside for athletics. I don’t know about you, but even though our front yard is pretty big, it’s not a dedicated soccer pitch. And there weren’t enough of us to be teams for flag football. We had to consciously seek out activities so our kids could learn to work as a team with someone other than each other. I mean, we’ve got to socialize those kids, don’t we?!? Because homeschoolers don’t get the right kind of socialization since they’re not surrounded by 30 of their peers for 6 hours every day, don’t cha know? At one time or another, we got our kids involved in drama, basketball, speech and debate, science clubs, homeschool co-ops and field trip groups, all in the name of exposing them to socialization and the kind of opportunities others got in “real” school. It depleted me. It depleted all of us. You say “yes” to one thing, and then it’s hard to know when to stop so you can focus on math, literature, science and history. Because while Stanford isn’t necessarily the goal, it’s still there in the back of your mind that if you don’t do your job right, your kid might someday be one of those people holding a “Will Wurk For Food” cardboard sign at the exit ramp off the interstate. Because in my mind, I should be the Martha Stewart of homeschooling, where everything is done perfectly! That’s not real life. No one can do everything, not to mention doing everything perfectly. 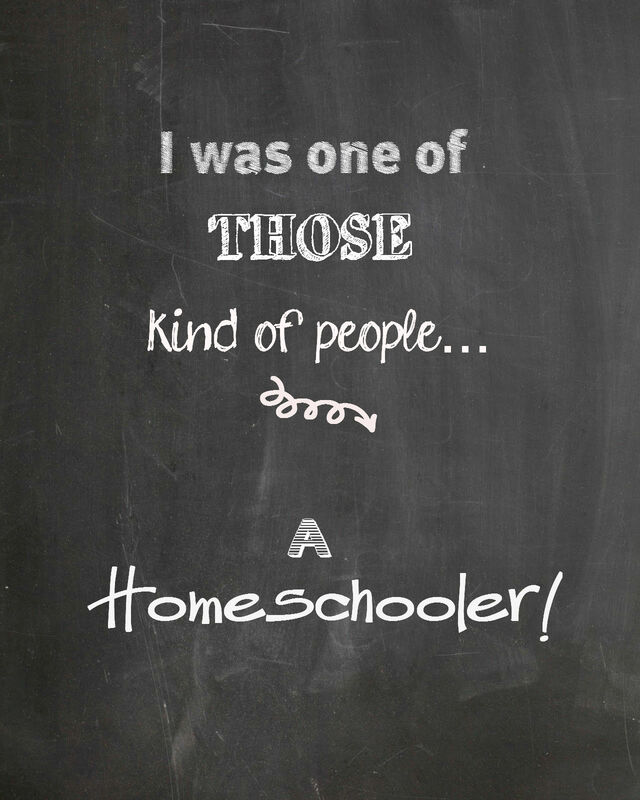 Why should homeschooling be any different? Yes, some days – weeks, months, years! – are harder than others, but in the end, sometimes the best lessons are learned because things are hard. And isn’t the goal of homeschooling just to LEARN?!? Love this post! Are there any parents out there who don’t question whether or not they are doing enough for their children? It surely helps to remember the goal of any schooling should be to learn! You’re so right, Traci! It’s hard whether you homeschool or not, to feel like you’re doing enough as a parent! Thanks for stopping by!